A tuka or spirit shrine in a homestead outside a hut (type known as barumai or dondomo with long eaves almost touching the ground), consisting of a split stick, the ends bound around, and ritual offerings placed within. 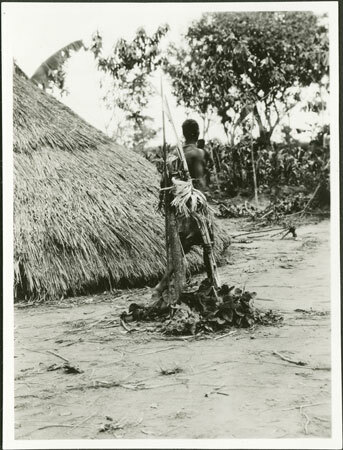 Fastended to the tuka is a spear and a bundle of reeds or sticks (possibly a consultation of the dakpa oracle), and below grows sarawa (food medicine). Morton, Chris. "Zande spirit-shrine outside hut" Southern Sudan Project (in development). 03 Jan. 2006. Pitt Rivers Museum. <http://southernsudan.prm.ox.ac.uk/details/1998.341.379.2/>.